SPECIAL OFFER FOR CURRENT CUSTOMERS ONLY. 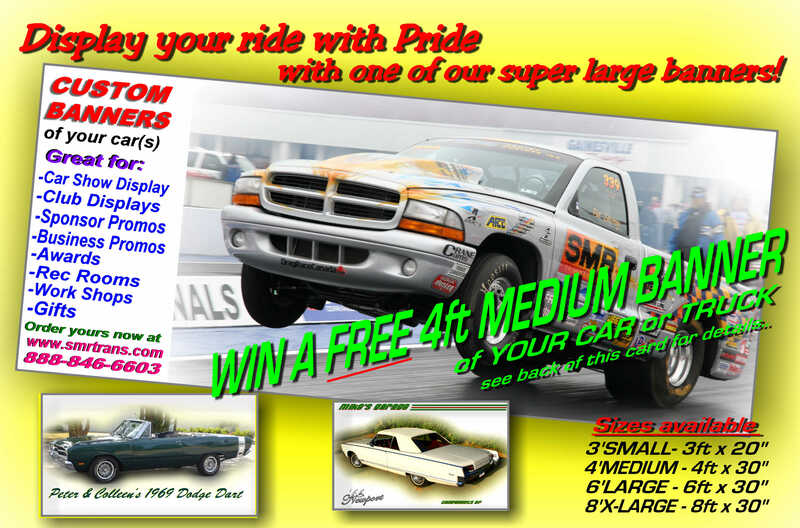 SMR Customers are being offered a chance to win a FREE 4' MEDIUM BANNER of his or her car or truck, utilizing products from SMR TRANSMISSIONS or CONVERTERS. This offer is only available until midnight February 29th, 2012 - ENTER TO-DAY so you won't forget. We are looking forward to getting your entry. SIMPLY FILL IN THE LINKED SURVEY ON YOUR EXPERIENCES WITH THE SERVICE and PRODUCTS OF SMR TRANSMISSIONS [INCLUDING A TESTIMONIAL THAT WE CAN USE ONLINE] AND ATTACH PICTURES OF YOUR PRIZED RIDE. a free medium banner to every 1 in 5 entries with an SMR Transmission and Converter. This is our special way of saying "Thanks for choosing SMR Transmissions" and helping us let other Mopar owners know what we have to offer them as well. -e-mail YOUR PICTURES TO service@smrtrans.com in .jpg format at a minimum resolution of 400-600 d.p.i. We will acknowledge receipt of your entry and keep you up-to-date on winners. 1- SEND or E-MAIL US A FEW PHOTOS OF YOUR VEHICLE AT A RESOLUTION OF 400-600 d.p.i. in .jpg format. 2 - IF YOUR VEHICLE IS SELECTED FOR A FREE BANNER, WE WILL FADE OR REMOVE THE BACKGROUND, SET-UP THE LAYOUT AND E-MAIL YOU A DRAFT FOR YOUR COMMENTS AND APPROVAL. UPON APPROVAL, WE WILL PROCEED TO PRODUCTION AND SHIPPING. NOTE: A "COMPLIMENTS OF SMR TRANSMISSIONS" NOTATION WILL BE ADDED TO BANNER. IN ADDITION, IF YOU WISH TO ORDER ADDITIONAL BANNERS, BANNERS IN OTHER SIZES OR OF DIFFERENT PHOTO ART, WE WILL GIVE A 15% DISCOUNT DURING THIS PROMOTIONAL OFFER.